The command New/Clock at the right part of the Media Browser window allows users to create a combined clip: adding it to a playlist line will start playout of a full screen TV-clock that displays the current system time of the server. 1. Import to the server database a previously prepared 24-bit JPG/BMP/PNG sequence or an AVI/MOV/MXF file that contains a full screen video with the animated clock in cycle, the so-called background, without arrows. Duration of such a file, as a rule, is one minute (1500 frames). The file may contain audio. 2. Import to the server database a sequence of 32-bit graphic files (PNG/TGA), or a file that contains video with an alpha-channel (AVI/MOV), with the full cycle of the hour hand rotation at 360 degrees. Smooth rotation of the hour hand will depend on the quantity of PNG/TGA files (or frames in AVI/MOV). Smooth rotation requires not less than 240 frames with the images of the hour hand phases. 3. Similar to the hour hand, import to the server database a sequence of 32-bit graphic files or a video with an alpha-channel that contains a full cycle of the minute hand rotation at 360 degrees. Smooth rotation of the minute hand also requires not less than 240 frames with the images of phases. 4. Besides, you should import to the server database a sequence of 32-bit graphic files or a video with an alpha-channel, containing a full cycle of the second hand rotation at 360 degrees. If the quantity of frames is 60, the discrecity of second hand moving will be one sec. Right click in the chosen folder of the Media Browser window, by the command New/Clock open a dialogue window. In the appropriate fields specify clips from the database, prepared according to the pt. 1...4, with the with the background, audio, hour and minute hands. Set the mode Hours Type (twelve hours) for an analogue clock. 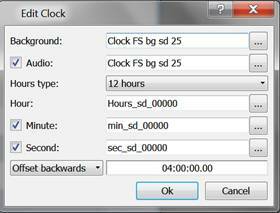 When forming a digital clock with numbers instead of arrows, you should set the mode of clock playout Hours Type as the twenty four-hours mode. There is a possibility of shifting the clock indications relative to the system time of the server (menu Offset Forwards/ Offset Backwards) in the format HH:MM:SS:FF. After the end of editing, a new clip displaying a clock will appear in the Media Browser window. There are no restrictions for the number of such clips in the server database, which gives an opportunity for automatic playback of a clock with different design as a part of a playlist during the day. When forming a non-fullscreen clock, the procedure is completely identical to the process described before, except one thing: you should use 32-bit files of a random size for a background (not necessarily full screen). After the end of editing, a new clip displaying a clock will appear in the Media Browser window. The next step is creating a new clip with graphic design in the Graphics Editor of the application Air Manager (New/Graphics). Place the window Media Browser near the window Graphics Editor and drag the clip with a clock from the Media Browser directly to the editing window. Herewith, a new PIP-object will be created automatically and the initial sizes of the clip with a clock will be saved. Then you should implement positioning the clock and save the clip with graphic design. Configuring transitions and effects and other operations with this object are identical to the procedures that are applied to PIP-objects (picture-in-picture) in the Graphics Editor.